Recombinant Plasmodium falciparum merozoite surface proteins detected by Western-blot. Malaria is a global disease causing up to one million deaths every year, mostly in young children under five and pregnant women in sub-Saharan Africa. Despite the huge humanitarian and economic burden of malaria, a truly effective vaccine remains to be discovered. However, the identification of target proteins could help in the search for a solution. Among the five Plasmodium species that can infect humans, Plasmodium falciparum is by far the most lethal. Symptoms of infection appear around two weeks after a mosquito’s bite, when parasites that initially develop in the liver are released into the blood stream in a form known as a merozoite. Merozoites recognise and invade our red blood cells, in which they multiply before bursting out and invading new cells. Because the parasite must invade our red blood cells to survive, proteins present on the merozoite surface have been proposed as prime vaccine candidates but only a handful have actually made it to clinical trials in humans. I joined the Cell Surface Signalling Laboratory at the Wellcome Trust Sanger Institute in 2007 when a major focus of the lab was to identify new cell surface protein interactions involved in early embryonic development using a technique called AVEXIS. When Gavin Wright and Julian Rayner thought about the malaria project, they decided to apply the same technique to a different problem: malaria parasite invasion. One of the tasks we set ourselves when the project started in 2008 was to learn more about proteins present on the merozite surface and understand their role in red-cell invasion to identify new vaccine candidates. To achieve this, I had to produce a panel of merozoite and erythrocyte (red blood cell) surface proteins in vitro. 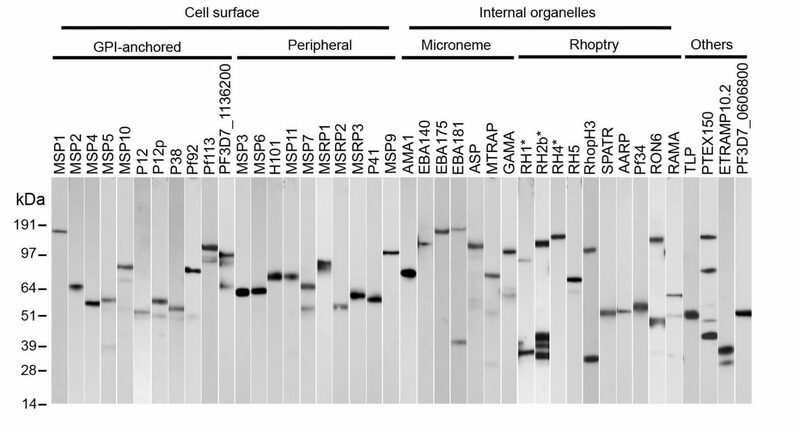 The extracellular regions of these proteins had to be expressed as a whole, as opposed to smaller subdomains, to maximise our chances of identifying new interacting protein pairs. This was a bit of a gamble – many researchers had tried to produce Plasmodium surface proteins using bacteria or in vitro translation systems in the past, with limited success. We decided to take a different approach: instead of bacteria, we used mammalian cells to increase our chances of obtaining correctly folded recombinant surface proteins. To my surprise (and delight), it worked! Out of the 51 parasite proteins that we selected, 42 could be produced in vitro. The great majority of them were also specifically recognised by antibodies produced by people living in malaria-endemic regions and who had become clinically immune to the disease, suggesting that the proteins were correctly folded and functional. Being able to systematically express these parasite proteins has created a lot of new research projects in our group but also collaborations with other groups worldwide. For example, using these proteins, I have discovered important new merozoite-erythrocyte interactions and, along with my colleagues Josefin Bartholdson and Leyla Bustamante, identified their functions. Together with colleagues from the Kenya Medical Research Institute (KEMRI-Wellcome Trust) in Kilifi, Kenya, we have also undertaken an analysis of patterns of immune response to try and identify the proteins that are associated with clinical protection against malaria. Overall, this panel of parasite proteins gives us a chance to increase our understanding of the parasite biology and maybe, one day, finally defeat a disease that has claimed so many young lives. Cecile Crosnier is a senior staff scientist at the Wellcome Trust Sanger Institute, where she works in the Cell Surface Signalling Laboratory. Cecile Crosnier, Madushi Wanaguru, Brian McDade, Faith H. Osier, Kevin Marsh, Julian Rayner and Gavin J. Wright (2013) A library of functional recombinant cell surface and secreted Plasmodium falciparum merozoite proteins. Molecular and Cellular Proteomics.